Many applications (including SERS, nano-sensors, luminescence, etc.) are based on the interactions between light and mater at nanoscale. 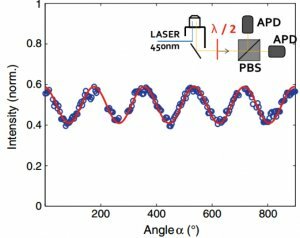 The emission properties of fluorescent nanoemitters can be strongly improved by coupling the emitters to photonic and plasmonic nanostructures. However, the orientation of a single emitter is crucial to optimize the coupling of its emission to this type of environment. By modelling the electric field radiated by the nanoemitter in various experimental configurations, some researchers of the group « Nanostructures and optics » from INSP have demonstrated that an emission polarization analysis leads to the determination of the three-dimensional orientation of a single nanoemitter. This method has then been experimentally applied to colloidal CdSe/CdS and CdSe/ZnS nanocristals, in collaboration with a group from LPEM, at ESPCI. 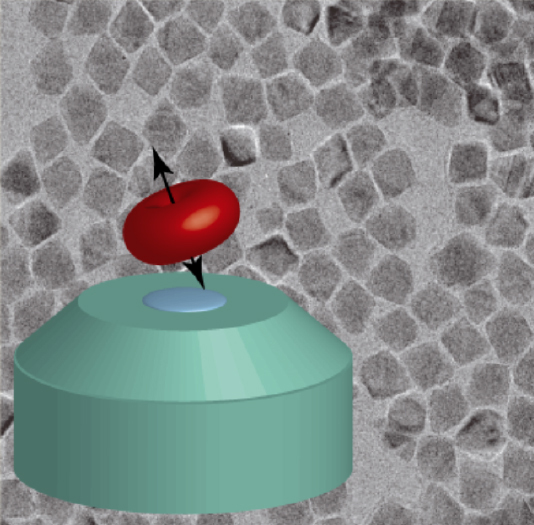 Thanks to this technique, single nanoemitters, which the orientation allows a deterministic coupling to the cavity modes of the nanostructure, can be isolated. The optical properties of a fluorescent nanoemitter (excitation efficiency, collection of light, spontaneous emission rate, …) are not intrinsic to the emitter, but are closely related to its local environment. By placing the emitter inside a nanostructure, it is then possible to achieve a coupling between the emission of the dipole associated to the emitter and the cavity modes. Nevertheless, the efficiency of such a coupling depends on the spatial positioning, on the spectral frequency and on the orientation of the dipole emission and cavity modes. Spatial positioning of an emitter and spectral tuning of its emission to cavity modes are now implemented by deterministic methods in several groups, but the measurement of the emitting dipole orientation remains an experimental challenge. Schematic of a dipole emission diagram collected by a microscope objective. Background : TEM image of CdSe/CdS nanocristals. A nanoemitter behaves as a dipole source which the orientation corresponds to the in-plane angle Φ and out-of-plane angle Θ. The emission of a nanoemitter depends, in terms of polarization, on its orientation (Θ,Φ) and on the experimental configuration (microscope objective numerical aperture, interface close to the dipole, etc.). A group from the group « Nanostructures and optics » in INSP has developed an analytic modelling of the radiated electric field within an experiment based on the emission polarization analysis (a polarizer is placed in in the emission beam and continuously rotated – Fig. 2). They have proved that the degree of linear polarization δ=(Imax-Imin)/(Imax+Imin) is related to the (Θ,Φ) dipole orientation, so that the angle Θ can be extracted from this experiment. Moreover, they have established general equations which connect δ and Θ. 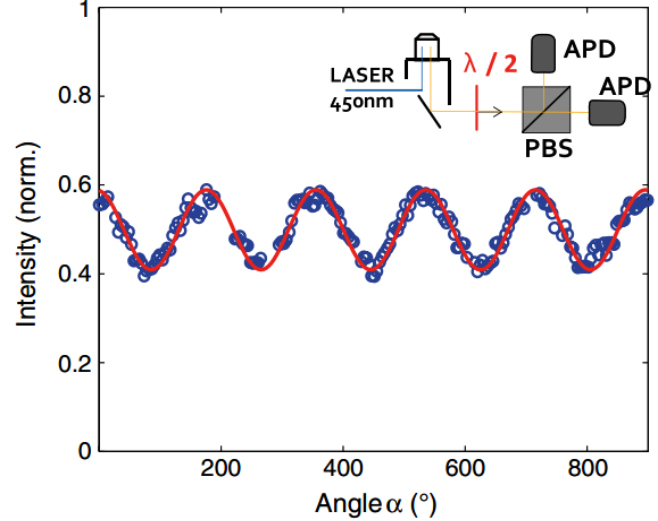 This method has then been experimentally applied to single CdSe/CdS colloidal nanocristals, synthesized by a group from ESPCI, in order to measure the three-dimensional orientation of their emitting dipole (Fig. 2). Emission intensity (normalized) from a single CdSe/CdS nanocristal as a function of the polarization analysis angle. The fitting curve (red) provides the degree of linear polarization δ (here, δ = 21%). The modelling shows that δ = 21% corresponds to Θ = 49°. The results achieved prove that fluorescents nanoemitters can be experimentally selected in order to choose their orientation inside a cavity, allowing their coupling to the nanostructure to be optimized.